Breathtaking Views. End unit townhome with large 1440 square feet. Like living in a detached home. 2 stories with no one above or below. 2 master suites with their own bathrooms, larger master has open view balcony. Brand new central forced A/C. Open kitchen and living room with large patio/yard and 3rd. bathroom on first level. separate laundry room. Parking directly below. New roof. Community pool/spa. Minutes to La Costa Resort, golf, The Forum Shopping Center and of course the beautiful ocean!, HOA has put on a brand new roof. Seller has already paid the special assessment in the amount of $6,500. Brand New HVAC. Brand new screens. 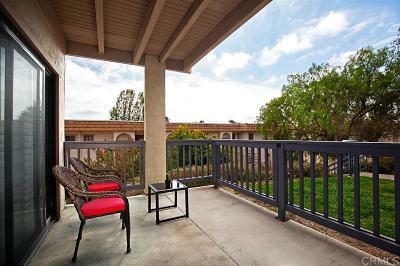 This property has a huge amount of outside patio space with views and a large view balcony upstairs in master bedroom. End corner unit with no one above or below you. Excellent La Costa location with fantastic School district. This one has it all!! !